With pork chops on the menu tonight, I wanted a side dish to compliment it... but something other than the usual rice, potatoes, heavy pasta, etc. Looking into my pantry, I had some orzo which seemed like a perfect fit. Rather than just boiling the orzo and being done with it, I found the following recipe on Cook's Illustrated. Many foods benefit from toasting to bring out more flavor such as spices, nuts, etc. 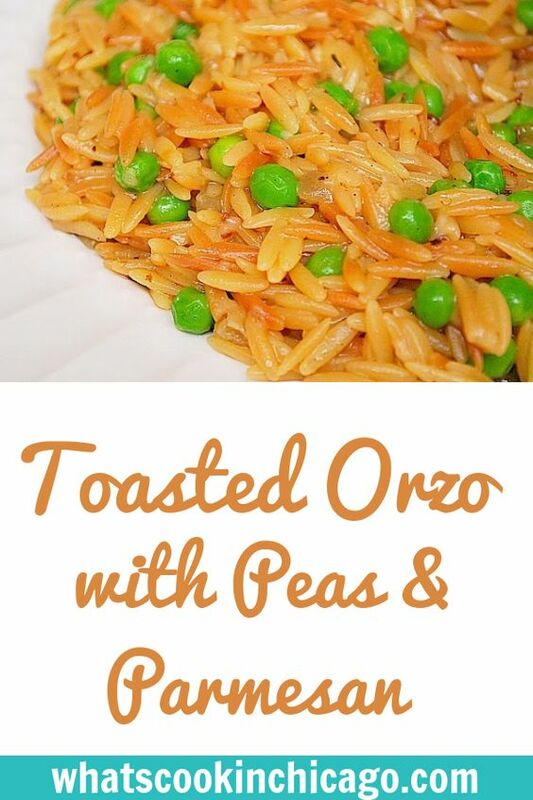 The same goes for orzo too, especially in this recipe. The orzo is toasted before allowing it to boil in chicken broth and white wine. It cooks down until the liquid evaporates and the orzo is perfect cooked. Peas are added with a touch of nutmeg and a good amount of freshly grated parmesan cheese finishes it off. This would be my preferred way to make orzo going forward! In 12-inch nonstick skillet over medium-high heat, melt the butter. It will start to foam around the edges and when foaming subsides, add onion and 3/4-teaspoon salt and cook, stirring frequently, until onion has softened and starts to brown. Add the garlic and cook for about 30 seconds. Add orzo and cook, stirring frequently until the orzo starts to toast and is lightly browned and golden, 5 to 6 minutes. Turn off the heat and add the chicken broth. Turn on the flame to a medium-high heat and bring to boil; reduce heat to medium-low and simmer, stirring occasionally, until all liquid has been absorbed and orzo is tender, 10 to 15 minutes. With rubber spatula, stir in peas, Parmesan, nutmeg, and pepper to taste. Let stand off heat until peas are heated through, about 2 minutes; adjust seasoning with salt and serve. thank you so much for the printer friendly recipes...WITH pictures. i am going to make the pork chops with the orzo this weekend for my son who is home from college.